As an internet radio broadcaster, costs can soon start to add up. Royalties, technology and software can all put a strain on non-commercial radio stations, making it tempting to look for cheaper alternatives that will bring the cost of broadcasting down. In an effort to keep the budget under control, some users turn to crack internet radio software as a way to broadcast for free – or at the lowest possible price. 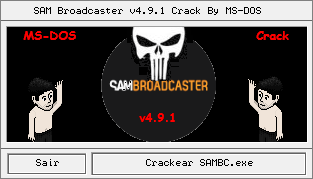 However, we’re here to tell you why you should never, ever fall for software such as SAM Broadcaster Crack, and to offer you a smarter, more reliable and affordable solution called SAM Broadcaster Cloud, from just $5 per month. The sophistication of hacking means that crack software from third party providers can be hard to spot and difficult to resist. Indeed, some can seem remarkably similar to the ‘official’ software at first. However, it’s important to realize that these rip-off versions are not only unstable and poorly configured; they also have the potential to damage your computer and jeopardize your personal information. Hacked copies of radio broadcasting software often carry viruses, or feature irritating pop ups that link to suspicious host sites. Some can ask for sensitive information such as bank details, phone numbers and home addresses, leaving you vulnerable to security breaches. For this reason, it’s crucial not to trust crack software hosted by third party providers. If you’re working on a low budget, you may be looking for a more affordable solution to sophisticated radio DJ software such as SAM Broadcaster Pro. That doesn’t mean you should settle for crack versions though. At Spacial, we understand that some of our users seek a more budget-friendly alternative, which is why we developed SAM Broadcaster Cloud. This powerful internet radio software gives you 98% of the benefits that our PRO version offers, from just $5 per month. So you can broadcast on a shoestring, without compromising on quality. Why not Try Out SAM Broadcaster Cloud Now! However, avoiding viruses, hackers and data loss isn’t the only reason why you should choose legitimate software. By subscribing to the real deal, you can benefit from all of the support that comes with your radio automation software, as well as receiving the latest updates as soon as they are released. Moreso, most leading software providers offer a free trial of their service before you commit, so that you can experience what a difference high quality broadcasting software makes to your radio station. Spacial believes in the importance of ‘try before you buy’, which is why we offer a 14-day free trial for our bestselling SAM Broadcaster Pro, with no limits and full functionality. What have you got to lose? Try out our free trial now! Don’t be tempted over to the dark side when searching for radio automation software. If it seems too good to be true, it probably is. Spacial offers smart alternatives to crack software, to make choosing the real deal a no brainer for your radio station. To find a plan that’s just right for you, browse our packages.